Basketball’s Roz Goldenberg, who excelled at both the high school and collegiate levels as a player, made history in 1988 when she became the first woman to coach a boys high school varsity basketball team to a CIF championship. Goldenberg began her basketball career at Poly High School in Sun Valley. She was a two-time captain of the squad and also team MVP. She went on to play four years at Cal State University Northridge, where she completed her degree in physical education. It was during college that Goldenberg began coaching at both Burbank and Holy Martyrs High Schools. Completing her Masters Degree at Humboldt State University, she helped coach the school’s women's basketball team for two years. 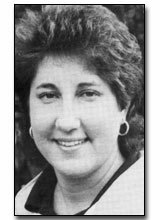 In 1982, Goldenberg took over the girl's program at Oakwood School, where her teams were undefeated in league play for two years. In 1984, history was made when she was appointed to take over Oakwood’s boy's basketball program. She immediately turned the program into a winner, highlighted by the 1988 CIF title. Since 1990, Roz has been Head Women's Basketball Coach at Sierra College.